For over 30 years, Camberley Judo Cub has been one of the UK’s top clubs. They are a totally unique judo club having programmes for everyone from children through to seniors to elite athletes competing at international level. The Camberley Judo club athletes had a number of successes at the 2012 London Olympics and gold metal winners at the 2014 Glasgow Commonwealth Games. 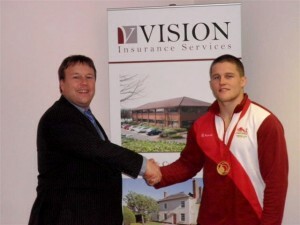 Vision also provide sponsorship to Owen Livesey, who is a Commonwealth Games Gold medal winner, pictured with David McKinnon, Director, Vision Insurance Services Ltd.
As a club who work hard with the local and wider community and who nurture success and achievement, Vision Insurance is proud to be associated with Camberley Judo Club.